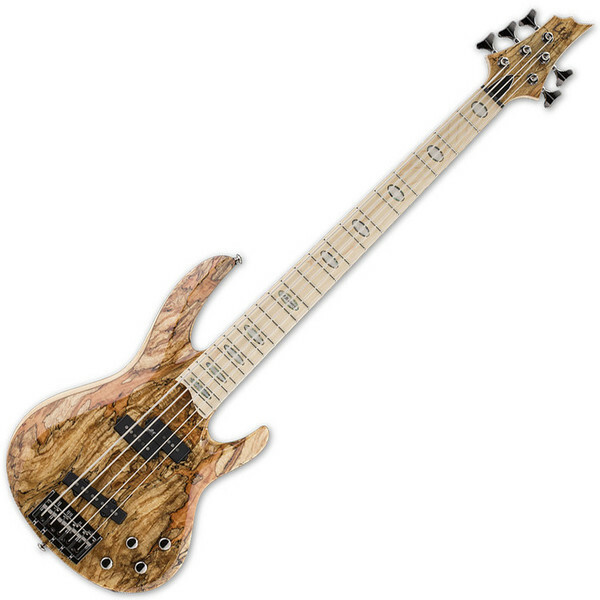 The ESP LTD RB-1005SM 5-String Bass Guitar is part of the LTD RB Series and features a Swamp Ash body with Solid Spalted Maple top, Maple and Walnut neck, a Maple fingerboard with 22J frets, finished in Natural. The 34" scale bass has a bolt-on-neck construction, Grover tuners and a Gotoh Bridge. The ESP LTD RB-1005SM 5-String Bass Guitar has a bolt-on neck with C contour, a scale length of 34" and Maple fingerboard with high quality components, making it great value for money. The Maple fretboard and Maple/Walnut neck featured on the RB-1005SM will withstand the test of time and usage as it has less reaction from environmental changes than other hardwoods. ESP LTD is a Japanese guitar manufacturer, established in 1975, primarily focused on the production of electric guitars and basses. Their product range will suit a wide variety of budgets and playing styles, with their popular Signature, Standard, Original, Graphic, Xtone, and Left Handed series' guitars. The company has a growing number of high profile artists who have designed their own signature weaponry, such as Ron Wood, Kirk Hammett, Jeff Hanneman and many more.